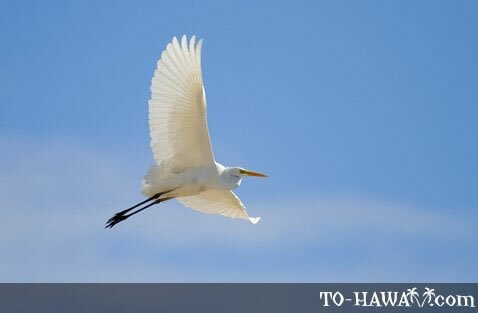 Also known as the common egreg, the great egret is a large bird with an all-white plumage. Adult birds can have wingspans of 65-85 inches (165-215 cm) and weigh up to 2.1 pounds (950 grams). It can be distinguished from other egrets by its black legs and feet and yellow bill. Adult males and females look identical and juveniles look like non-breeding adults.